Style, reliability, and comfort all come together in the efficient Toyota Corolla. 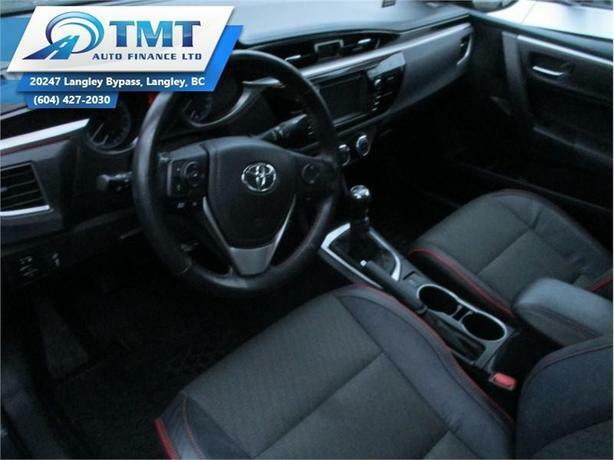 This 2015 Toyota Corolla is for sale today in Langley. The Toyota Corolla debuted in 1966 and there is no stopping this legend. Completely redesigned in 2014, the 2015 Corolla is a perfect example of Toyota durability, quality, and reliability. It has a sleek, sporty look that will turn heads everywhere you go. The Corolla is a fun to drive compact that is excellent on fuel and offers more than just being a commuter vehicle. The ride is smooth and well mannered in the corners while the interior and exterior design is sure to make you fall in love. This sedan has 80757 kms. It's grey in colour. It has a 6 speed manual transmission and is powered by a 132HP 1.8L 4 Cylinder Engine. It may have some remaining factory warranty, please check with dealer for details. Buy this vehicle now for the lowest bi-weekly payment of $84.63 with $0 down for 84 months @ 4.99% APR O.A.C. ( Plus applicable taxes - Plus applicable fees ). See dealer for details.